There is something deliciously decadent about drinking on a weekday afternoon in a near-empty central London pub, while the rest of the world hurries by. After a lifetime of snatched lunches, it is one of the pleasures of retirement to be able to give proper time to that extra pint or two. Today was such an occasion. We didn’t get drunk but definitely mellow. The more relaxed, the greater our insights into life’s mysteries. As my chum finished his pint, he made an observation which just about paraphrased the chorus of Nat King Cole’s version of Nature Boy. He had never heard of Eden Ahbez’s 1948 song but its message is eternal. 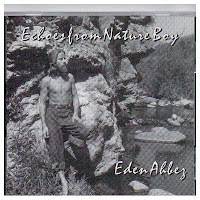 A hippy ahead of his time, the strange story of Ahbez (or rather eden ahbez; he believed only God and Infinity should be capitalised) – is told succinctly in this Space Age Pop Music link. Cole’s performance follows after the turn. My dad liked Nat King Cole.